A very aggressive overtaking wild ground-cover plant with yellow flowers. One variation has green leaves with silver markings on the leaves. 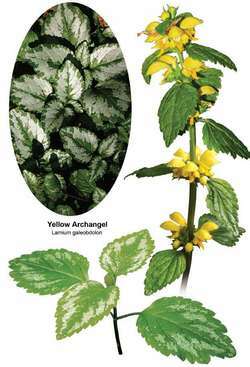 In mint family (square stems, opposing leaves) Called “Yellow Dead Nettle” because they look like nettle but don’t sting. Popular in old European folk medicine for bladder control issues in elderly, and as astringent for wounds, cuts and ulcers. Doesn’t smell very pleasant. AT BURSCOUGH, Jim Brady reports flowering yellow archangel, a strip of this coloniser was 29 yards by 10 yards long there. John Dempsey on country matters.. Honesty, teasels, yellow archangel, aquilegia and the Welsh poppy along with wild violets and dandelions. Woodland plants such as yellow archangel and sanicle fared worst, with 56 out of the 72 species becoming significantly less common.